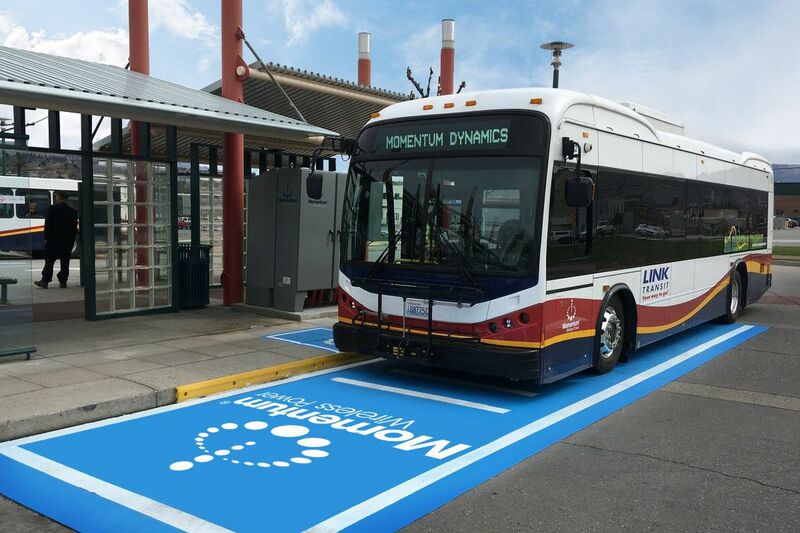 An electric bus in Wenatchee, Wash., equipped with a wireless charging system is positioned over a charging pad that can transfer energy through the air into a receiver mounted under the bus. Several of America's biggest cities have discovered a way to fight climate change, save lives, and slash spending — all at the same time. The secret? Electrifying their bus fleets. Public transit is currently the most environmentally friendly and energy efficient way to travel. Rolling out more electric buses will compound those benefits. Consider what's happened in San Francisco. The city's transit agency acquired new, environmentally friendly hybrid-electric buses. The switch will reduce the fleet's carbon dioxide emissions by 82,000 tons over the buses' lifetimes. That's the equivalent of taking 16,000 cars off the road for a year. And those numbers will surely increase; the agency recently unveiled a plan to transition to all-electric buses by 2035. Fortunately, the decision to go green won't put San Francisco in the red. Electric buses tend to have much lower operational costs than traditional buses. San Francisco is hardly the only city to embrace electric buses. As of 2016, 17 percent of all public transit buses in America were fully or partially electric, while 2 percent of cars were. Over the past eight years, America has quadrupled its share of electric buses. By 2030, 60 percent of bus sales in America could be all-electric. Philly's Southeastern Pennsylvania Transportation Authority, for example, has ordered 525 hybrid-electric buses and recently received a $1.5 million Federal Transit Administration grant to purchase 10 new electric buses. The transit agency plans to have hybrid-electric buses make up 95 percent of its bus fleet by 2021. If it fully transitioned to electric buses, SEPTA could reduce its greenhouse gas emissions by 22,000 tons a year, the equivalent of removing more than 4,000 cars from Philadelphia's roads. The Chicago Transit Authority plans to expand its electric bus fleet by 2020, as do the transit authorities of Madison, Wisc., and Louisville, Ky. New York is aiming for an entirely electric fleet by 2040. Los Angeles is looking to transition its entire bus fleet, the country's second-largest, to electric power by the end of next decade. Mayor Eric Garcetti explained the rationale, saying, "We can wait for others, and follow, at the expense of residents' health — or lead and innovate, and reduce emissions as quickly as possible. I'd much rather do the latter." These cities are all realizing the immense benefits of going electric. At the macro level, switching to electric buses is good for Mother Earth. Even when accounting for its energy source, electric buses emit less than one-third as much climate-change-fueling carbon dioxide as regular buses. Electric buses also save lives. Every year, nitrogen oxide from transportation emissions contributes to about 38,000 premature deaths worldwide. Simply put, buses help lower noxious gas emissions because their use results in fewer cars on the road. If we don't make the switch to electric buses, energy costs for individual drivers will continue to escalate. In 2017 alone, U.S. motorists spent 41 hours in traffic during peak times, costing each driver $1,445. Electric vehicle skeptics often say that the cost of switching is prohibitive. A few years ago, they might have had a point. Battery costs have come down dramatically and will continue to fall. Batteries are now five times cheaper than they were in 2010. Some studies estimate electric buses are 40 percent cheaper to maintain than traditional buses and save more than $360,000 in fuel costs over their lifetimes. The transportation sector accounts for more greenhouse gas emissions than any other. Lowering that total is crucial to our own physical and fiscal health, not to mention the planet's. Plenty of public transportation authorities nationwide have started to take the challenge seriously by electrifying their bus fleets. It's time for every city to take notice, and for leaders at all levels of government to support the switch. Paul P. Skoutelas is president and CEO of the American Public Transportation Association. MacPherson Hughes-Cromwick is a policy analyst at the American Public Transportation Association.